- A Rastenwähler, which has 4-memory positions in addition to a basic neutral position "U"
The manual settings can be normally done with the Rastenwähler = U, locking lever “fest” (stopped). 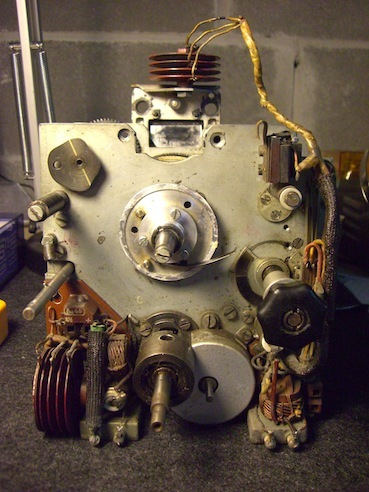 At the beginning of the memory setting procedure it is necessary to verify if the Rastenwähler = U, locking lever is in “fest” (stopped) position. Now the Rastenwähler must be switched from "U" on one of 4 memory locations where you intend to save the frequency. Then the motor control unit will select the previously stored frequency. Now, set the locking lever to "lose" (released). Then is possible to select the new frequency that is to be memorized (preset). After that the frequency is manually chosen, it is necessary to set the locking lever * to "fest" (stopped) position again. Now the frequency storage procedure is completed and it is possible to set again the Rastwähler selector in the neutral position "U". When it is necessary to recall the previously stored frequency the mechanical system will select the appropriate band by means of another motor. Both the electrical motors run simultaneously and independently from each other. The stored frequency in a “fest” (stopped) conditions can be slightly modified into both directions. When the possible detuning limit is reached a friction joint is holding (stopping) the movement on the scale display. With an axial pressure at the Grob tuning shaft the initial central stop position is being restored. This tuning resetting takes place purely mechanically by means of spring loading. If the frequency range selector is activated manually the band motor starts immediately and restores the preset frequency band. However, in case of motor drive failure it is possible to set manually the frequency band selector: set the locking lever again to "fest" (stopped) and the Rastwähler in neutral "U" (U =ungerastet) position. Then turn the frequency knob until a tactile snaps. The correct frequency is then reached. This works even when the power is switched off. The original manual L.Dv. 702 /1 recommend writing with a pencil the Rastenposition frequency on a front-panel table. On the circumference of the disks are present notches that, by means a trigger lever, activate the switching functions relating to the engines. 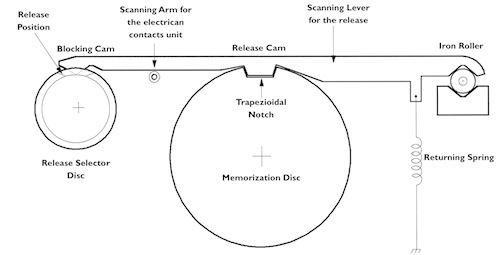 In this disabled position, the axial angle position of the disks represents the information stored. Release frequency selector manipulates a third axis, which is used in common for frequency tuning and band range. Each one of these notches trigger one of the four levers in function of one of the four-memory position selected by the raster knob. This means that each lever has two contact points, one to produce the release, the other to lock it. The first position U of the raster selector looks all preset positions available and than render possible, disconnecting the 12 VDC at the motor unit, the manual control. -To store the tuning frequency the feeler levers cams are free and mesh into corresponding holes of the releasing disks. The release is triggered through notches on the circumference of the respective disk tuning. The less required precision in the frequency band storage make possible a more compact construction with feeler levers much smaller. 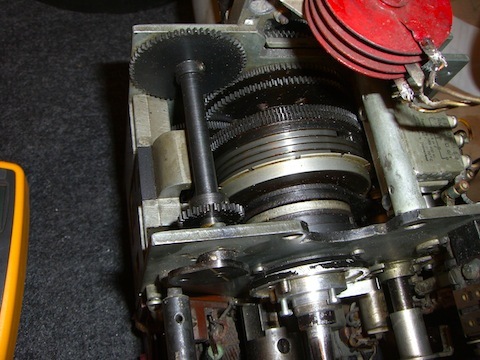 With Rastwähler selector in the neutral position "U" the switching position the axle, for fine manual control tuning is engaged, while the gear for the motorized tuning at same axle is disconnected. By shifting the axle between the two coupling positions (engaged / disconnected), by the magnet, the mechanical coupling is reversed and than motorization is activated. Figure shows the frequency release lever, with the related returning spring. There are two cams. 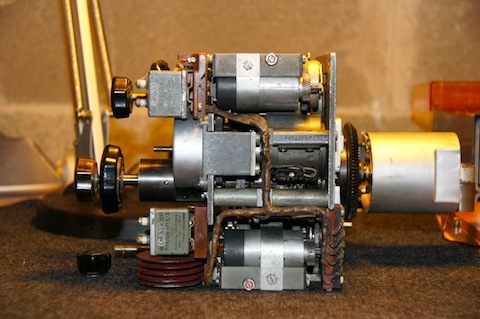 The triangular cam (blocking cam), at the end of the lever, is used for activate or deactivate the lever in function of the selector position. With the other cam, with slightly trapezoidal shape (release cam), in the center of the lever, is scanned the disk for frequency storage. The movement generated by the release activates the electrical switch for interrupt the current at the frequency tuning motor. 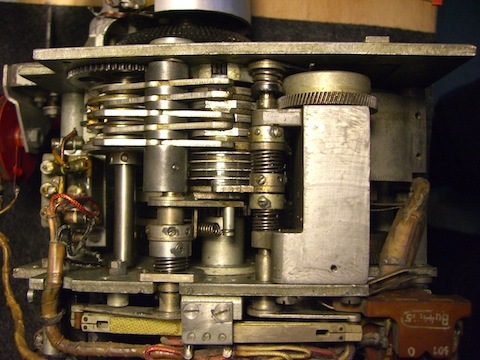 This particular extraordinary mechanical implementation allows, when the system arrives at the release position, with consequent motor switched off, some frequency manual adjustments with the fine manual tuning know correction in both directions, with the possibility to automatically return at the original release position, pushing the approximate frequency tuning knob (the smallest tuning knob). The scanning lever, through the tension spring, that is always pressed on the disc, is placed on a V-shaped notch and can rotate on a small roller, which in turn remain on a corresponding block based V-notch. Thanks to this spring the roll is always kept well pressed in his notch, till the lowest allowed point. And so it moves the roller from its symmetrical position to asymmetric position at the V notch and simultaneously increases the tension on the spring. However, with the cam located at the top, which keeps the four levers and rolls in place these mechanical elements are set at its movement’s limits in both the directions. Frequency Band V from 17600 to 25200 kHz, DeltaF = 25200 – 17600 = 7600 kHz, disk diameter = 70 mm, disk surface S = 70 mm x 3,14 = 219,8 mm Deltal = 0,5 x 0,95xS = 104,4 mm, this means about 0,014 mm / kHz or 72,8 kHz / mm. Differently to the principle used for the frequency memorization in case of storage of the frequency range memorization are used nosing on the discs surfaces instead of notch.